The term longphort is a compound word that may have been coined by Irish monks – long meaning ship from the Latin word “longus” and port from the Latin word “portus”, meaning landing place or shore. A longphort was basically a fortified naval encampment which served as a base for raiding parties as they attacked and plundered sites in the surrounding area. Intended as overwintering sites, longphorts were found along rivers (usually at a tributary) or in estuaries (such as the Broadmeadow estuary) where ships could be safely moored and protected. The sites were easily defended, sheltered, and gave speedy access to the open sea if required. Initially, a longphort would be built by beaching a long ship and then building up a bank of earth against it on the landward side.3 This might then develop into something more permanent with added fortifications and living quarters. The longphort at Linn Duachaill (Louth) and the one which eventually became the city of Dublin (dating to the 9th century) are good examples. Historical maps made between 1829 and 1842 show a 2 acre island at the northern end of Cave’s Marsh. With the construction of the railway viaduct in the 1840s, creating what is effectively an artificial saline lake with a vastly reduced tidal range, the island gradually disappeared as the surrounding water channels silted up (the island is also visible in the Clarges Greene & Son map of 1851). 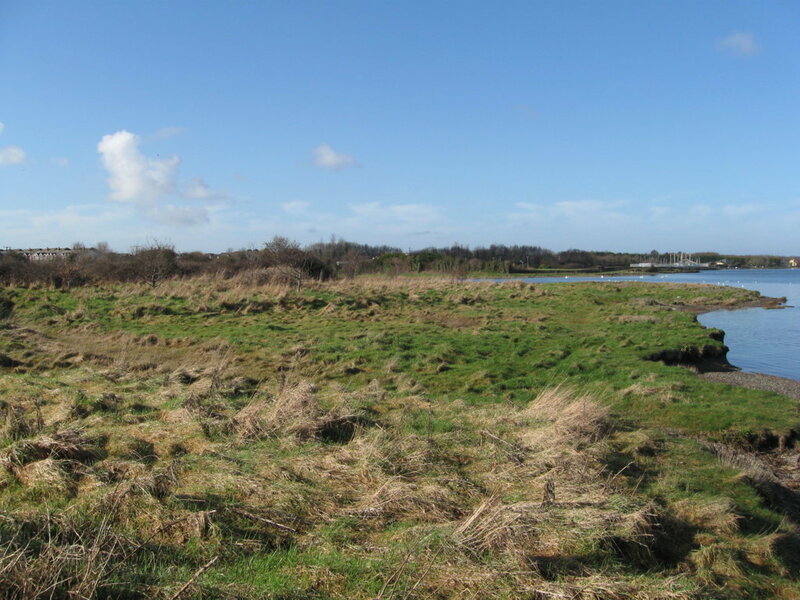 If there was a temporary Norse settlement at Cave’s Marsh, the island would have been a logical choice being an easily secured and defended site. 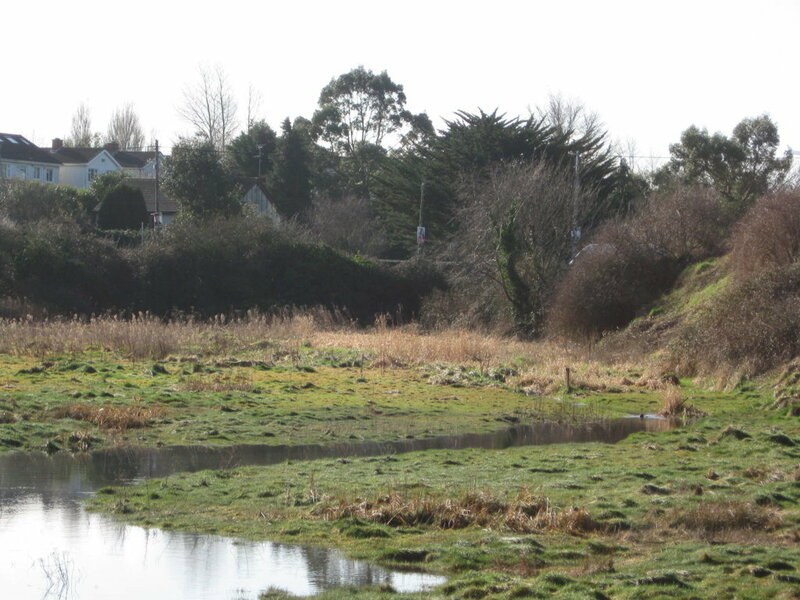 The Cave’s Marsh site would also have been an ideal location from which to launch attacks on the major monastic sites at Lusk, Swords and smaller ones such as Glasmore. Glasmore was an abbey one and a half miles from Swords. There are conflicting reports about when the abbey was founded. Some accounts say it was founded by Saint Cronan about a century after Saint Columba founded his monastery at Swords, which would put the date somewhere about the 7th century. In the same century it is recorded that the Vikings of Cave’s Marsh attacked and destroyed Glasmore. The accuracy of this account must be questioned as it predates the generally accepted period for the beginning of Viking raids in Ireland by about 200 years. 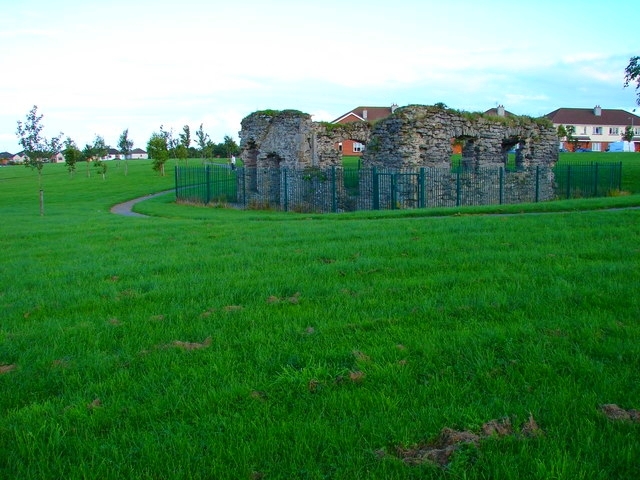 The remains of Glasmore Abbey can be seen today, standing on an open green space in the Lios Cian estate, off the Murrough Road near Swords. 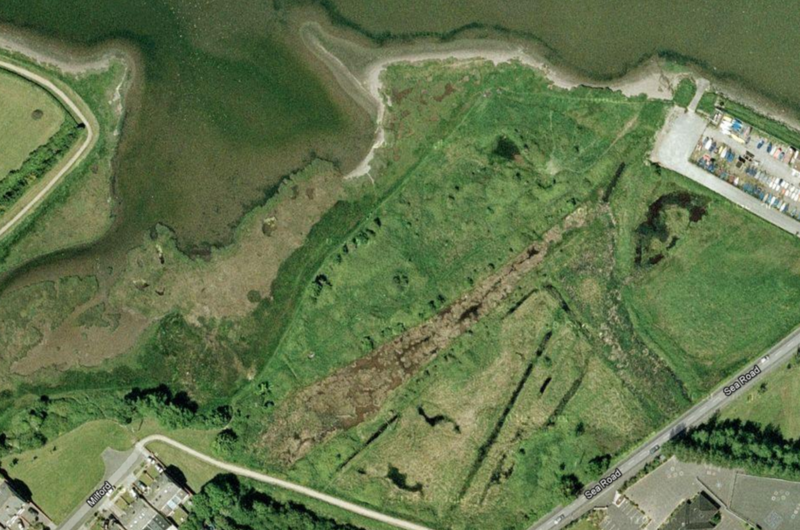 The “Annals of the Four Masters” tell us that Malahide was their [the Norse] chief and favourite centre of settlement. To any person familiar with the country and its surroundings, the sagacity which prompted their choice of this place is apparent. Here in the little bay was a safe and easy harbour for their ships; here also was a splendid centre for attack on the rich Christian settlements of Swords and Lusk; while from here expeditions of raid and plunder into the adjoining counties of Meath and Louth could be successfully carried on, with the seaboard to guard against attack on the other side, and to afford a way of escape in case the Celtic owners of the soil should pursue and force them to retreat. Thus the little town of “Id’s Fort” rose to a sad pre-eminence. He who will take the trouble to visit the inhabitants of this singular district, observe the large heads, long visage, and foreign features, will probably be disposed to suspect that the traces of a Danish occupation are not wholly obliterated from the vicinity of Fingal. …the people are found to be essentially different from the generality of the peasantry in most other parts of the province. They express themselves in language of much accuracy, and totally free from the broad accent of other places. 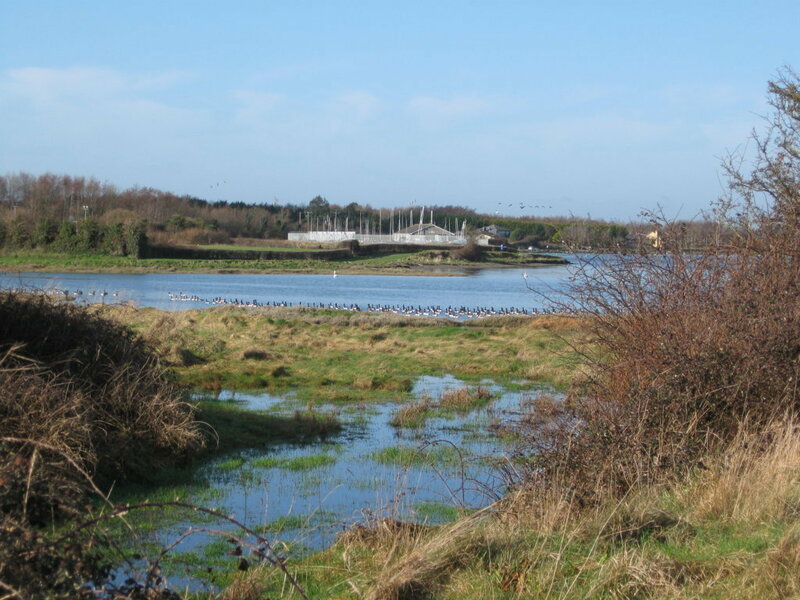 *Inbher Domnainn is an ancient name for the Broadmeadow estuary. There are several variations on this name in the historical records including Inbher Domnonn, Inbher Domhnann, Inver Domnann, and Inver Domnon. † ‘Viking’ is a collective name for those sea raiders who came from Denmark, Norway and Sweden. ‘Viking’ comes from the Old Norse word vikingr which means “sea robber” or “pirate”. 1. Walsh , Robert. Fingal and its Churches: a Historical Sketch of the Foundation and Struggles of the Church of Ireland in that part of the County Dublin which lies to the North of the river Tolka, 1888. 2. 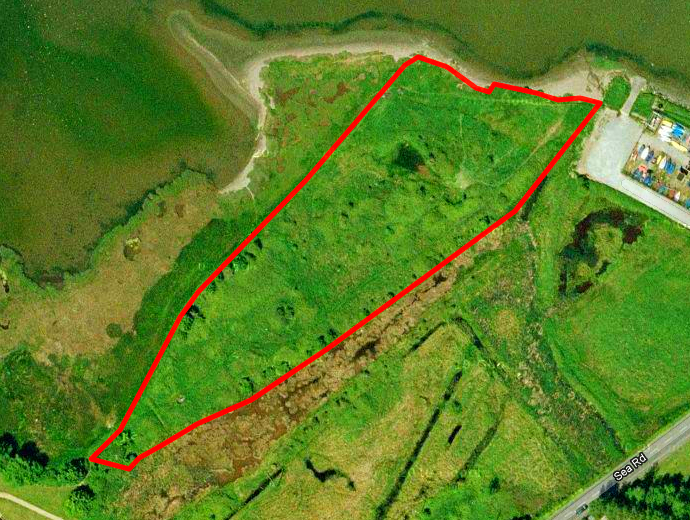 Headland Archaeology (UK) Ltd. Ireland to Anglesey Sub-Sea Cable: Maritime Cultural Heritage Impact Assessment Vol. 1. Ireland. 3. Sheehan, John, 2008. The Longphort in Viking Age Ireland, Acta Archaeologica 79:282-295. 4. St John Joyce, Weston. The neighbourhood of Dublin: its topography, antiquities and historical associations. S.R. Publishers, 1939. 5. Archdall, Mervyn. Monasticon hibernicum: or, A history of the abbeys, priories, and other religious houses in Ireland; interspersed with memoirs of their several founders and benefactors, and of their abbots and other superiors, to the time of their final suppression. W. B. Kelly, 1876. 6. Reeves, William. A Lecture on the Antiquities of Swords. Swords Parish Magazine, February 1861. 7. Morgan, Charles Thomas (sir. ), Morgan, Sydney (lady.). The book without a name [essays], 1841. 8. Newenham Wright, George. Scenes in Ireland: with historical illustrations, legends, and biographical notices. Thomas Tegg and son, Cheapside, 1834. 9. Mernagh, Michael. A Brief History of Languages in County Wexford. In ‘The Past,’ the Co. Wexford Historical Society Journal, No 29, 2008. 10. Reproduced under licence from Ordnance Survey of Ireland; Licence No. NE 0000414. 11. Vandeleur, WE. Notes on Malahide. W. Tempest, Dundalk. Dundalgen Press, 1915. 12. Frazer-Crichton, E. Historic Houses of the United Kingdom: Descriptive, Historical, Pictorial. London: Cassell & Co. Ltd., 1892.